Redefine the concept of comfortable hotel living at the SpringHill Suites San Antonio Airport. We offer everything you need for a relaxing and reinvigorating stay, including free Wi-Fi, complimentary shuttle service to and from San Antonio International Airport, and free breakfast every morning. Our convenient location near Loop 410 gives you easy access to the entire San Antonio region, and we're only fifteen minutes from downtown and the historic River Walk. Here with family? SeaWorld San Antonio and Six Flags Fiesta Texas are among the many superb attractions at your disposal, and you can enjoy shopping at its best at nearby North Star mall. Relax at the end of the day in your spacious suite, which feature 37-inch flat screen TVs, a microwave, mini-refrigerator, and a pullout sleeper sofa. 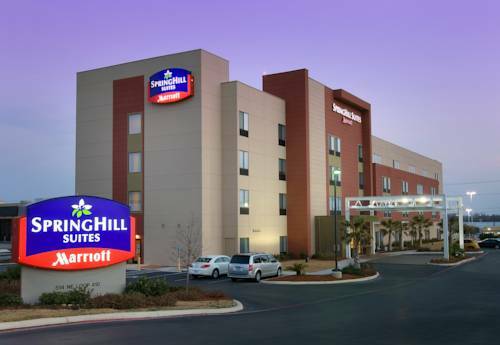 The SpringHill Suites San Antonio Airport will help make your stay in our city truly memorable. - Raytheon Aircraft Services, Inc.
- Kraft Foods Global, Inc.